Our epic odyssey will end with “The End”. But before the end comes The Finale. (Strawberry Fields, Tomorrow Never Knows). 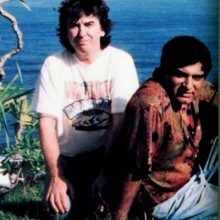 Certainly one of the contenders for that unawardable prize is George Harrison’s “Something”. There are not many, if any, songs that have been covered by Ray Charles, Elvis Presley, Frank Sinatra & James Brown but “Something” is one of them. “Something” is a template for the mystical element of love. Mixing the spiritual with the sexual “Something” is a most satisfying song because it describes the indescribable. The moment where the object of one’s desire takes you to a higher plane. You don’t know why, you don’t know how but it’s… something. But it’s not quite that. It is the only thing that can sustain a love or a spiritual life. A doubt that is conquered. It is something, It is nothing. it is everything. Originally we were going to have Sir Paul sing this song but he was busy writing an opera and touring the world and making dinner for the grandkids so of course we approached Deepak Chopra. 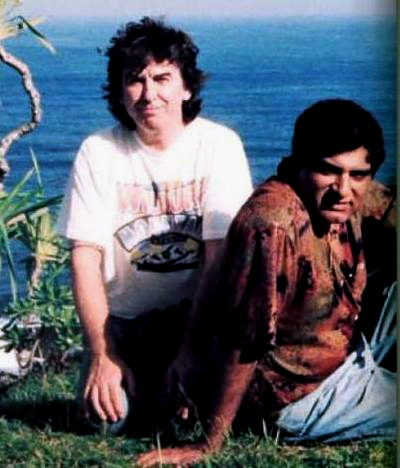 Deepak is no singer but he knows a thing or two about mysticism and love and he was a pal of George . When we asked he jumped at the chance to perform the piece, instinctively connecting to the psychically healing powers of the ukulele, The Beatles in general and this song in particular. Special mention should go to arranger and sadist Roy Harter who conducted the TBCOU orchestra using his custom designed whip baton. Deepak Chopra is an Indian-born, American physician, public speaker, and writer. He is specialized in subjects such as spirituality, Ayurveda and mind-body medicine. Chopra began his career as an endocrinologist and later shifted his focus to alternative medicine. He now runs his own medical center with a focus on mind-body connections. [clarification needed] He is also a lecturer at the Update in Internal Medicine event. 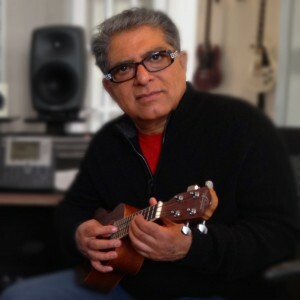 Chopra was an assistant to Maharishi Mahesh Yogi before starting his own career in the late 1980s by publishing self-help books on New Age spirituality and alternative medicine.